The highlight of this visit must be the stay in the Chobe National Park. This park is famous for its elephants and they are truly spectacular. Once again the sunsets are amazing. Returning to Botswana was exciting because I had left the previous time having seen very little of it and feeling dissatisfied. Now we were back. The Botswana border officials were refreshingly efficient and we were soon armed with 3rd party car insurance (available at Kazungula) and six months worth of road tax - all for a fiver. Before leaving Zim we had stocked up with bacon and sausages from the Spar forgetting about Botswanas policy of not allowing uncooked meat imports. No-one had checked on the previous journey into Botswana - but this time they did! The man at the veterinary control point ordered us to burn the bangers. We refused and had a cook up at the side of the road. Ha ha - bacon butties! We eventually got through the checkpoint after an obligatory drive through the disinfectant dip and a shoe wipe over a disinfected towel. This is meant to remove imported bugs from Zimbabwe! 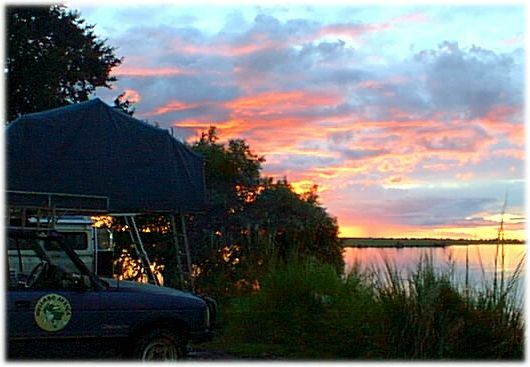 That night the Chobe Safari Lodge was a delightful spot on the river where we relaxed by the poolside with a cool St Louis beer and made plans to meet Gordon in Maun on the following day. There are two routes to Maun. 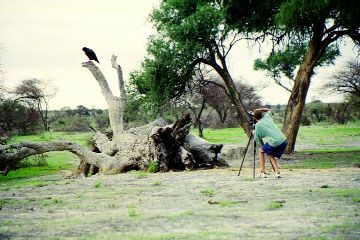 One is exceptionally far by tar, the other exceptionally long over sand along the Chobe National Park transit route. We took the latter as it sounded like more fun. 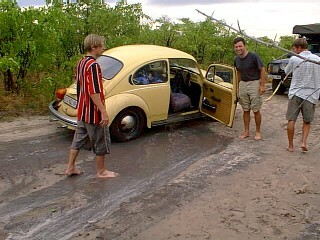 Nine hours later we emerged from the sand and mud to find a VW Beetle stranded mid puddle with its axle grounded on a ridge. We were the first car to pass in five hours and towed them out easily. They were keen to continue as they wanted 'to see some animals, man'. They were only 1 km into the park at this point and were already stuck. We warned them of the other thirty or so puddles and told them we'd be back in a few days if they needed another tow! That night we met up with Gordon and had a monster night playing drinking games with his chums. Agnes! 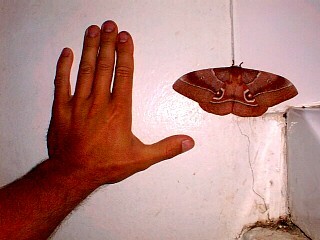 The campsite on the outskirts of Maun was very pleasant - with the exception of the bugs in the sink. As the next day progressed, so did the hangover. 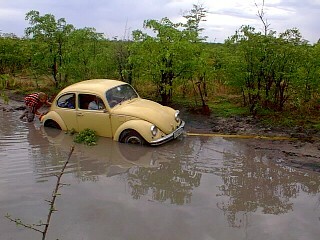 It got worse and shopping in Maun was not much fun. Driving through Maun we both shouted "there's Turtle" and there was Sally and Noel over 2000 km away from where we had last seen them. The hangovers were temporarily forgotten as we made plans for a reunion that night. Rehydration tablets added to the beers helped us to get through the evening but sadly the reunion wasn't to last that long as Sally and Noel were off to Moremi the following day for what turned out to be a very muddy adventure. 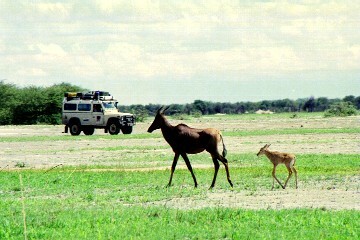 Punda and Comet took a different road towards Chobe where we bushcamped near the entrance gate to avoid park fees. It was so good to be camping in the wild again. The journey to Savuti camp was uneventful. The park was very green and dense and the animals well hidden. At the camp we were prepared to do a bit of grovelling to get a campspot as we had not booked. It was the usual story - you should book ahead (Bots policy) but that means too much inflexibility. If you don't book then Mr Campsite is not very happy. Anyway, they allowed us to camp on one of the sites (each has a braai pit and can cater for 10-12 people) but were told that "if anyone who has booked arrives before 5.30pm then you will have to move". Of course we agreed, then I asked how many had booked. None!!! That's Botswana logic for you. We couldn't be bothered to go for a game drive that evening so we lit the fire to cook sirloin steaks and to bake apples. 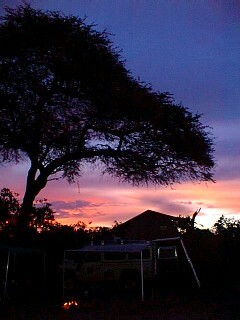 An evening of scrabble was very relaxing indeed, particularly with the view of one of Botswanas beautiful sunsets. 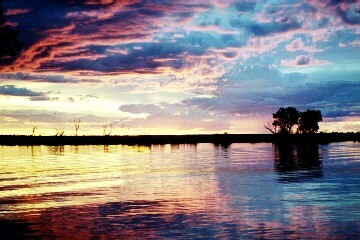 Botswana sunsets really are the best in Africa. That night we were awoken by a rustling sound which turned out to be a hyena opening Gordons plastic condiment tub and trying to run off with it. In the morning we tested our field guiding knowledge and tracked the hyena spoor (footprints) and discovered its route through our camp - at one point putting its front paws up the side of Punda. It must have thought there would be offerings in the tent. The following day was spent game viewing around the Marshes area which was very exciting. A bit of sand along the route provided some extra fun. 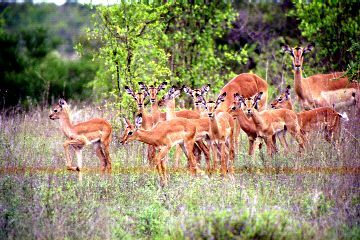 We spied bat eared foxes and a Lechwe for the first time. Gordon disappeared at one point as he went off in search of his sunglasses which had fallen off his bonnet while he was videoing. With no Gordon in sight we had to track him using Comet spoor. Eventually we found him and after half an hour of retracing steps he found his glasses. We had spent longer out that day than originally planned so back at Savuti we had a repeat performance of begging for a camp-spot. The Chobe riverfront in the north is where most of the action can be found. Beautiful drives along the waters edge provided hippo and crocodile viewing opportunities. 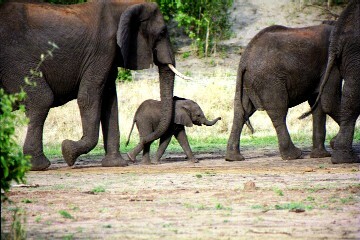 We were disappointed that we had seen no elephants for which Chobe is famous. That was until 2 km from the exit gate where we came across 75 of the things walking by the side of the road. Wow - such an incredible sight. They were 50 m away from us and didn't show any sign of being bothered by us passing. Chobe delivered and we left on a big high. Back at Chobe Safari Lodge the evening was topped by a magnificent sunset whilst eating curry by the riverside and listening to the grunting hippos. Breakfast too was accompanied by hippo grunts as they moved into the water for the day. Cheeky monkeys scurried around the cars looking for a nibble - but failed. Soon we were back at Kazungula and over the border to Zim.